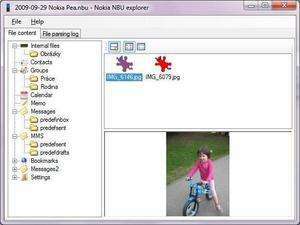 NbuExplorer is a downloadable Nokia tool which gives users full access to their NBU backup files, among other types of backup files. Like Windows Explorer, the graphical interface of the Windows distribution of this program is easy to find your way around in. It is fully dedicated to opening files created by Nokia OVI suite. The good thing is that it works with virtually all versions of NBU and backup files created by Nokia PC Suite. Version 3.3.88.40087 is a freeware program which does not have restrictions and it's free so it doesn't cost anything. For security reasons, you should also check out the NbuExplorer download at LO4D.com which includes virus and malware tests. Additional screenshots of this application download may be available, too. NbuExplorer has a presence on social networks.